I’m here to sharpen my knife, y’all. I’m embracing the intersection of my passions – food, writing, and photography. While I’ve definitely seen plenty of food writers and photographers who’ve made it (and inspired me in all the ways), I hardly (if ever) see what they did in the beginning before they killed it. I do want to make sure I set myself up for success as I embark on this journey. So, this space will document my purposeful learning and growth to help me refine my goals and objectives while building my (written and visual) portfolio. Share what I’ve learned about my creative process along the way! I’m sharpening my knife real sharp before I take my first clean slice into that pie. Not exactly sure if I want to slice into a short rib pot pie or a duck fat potato galette (or both as Mr. Hungry would suggest), but that’s okay. So if you’re also someone who wants to start writing, cooking better, or taking better food pics we can teach each other a thing or two along the way. You can find the nitty, gritty details to my commitment and project in my manifesto here. Pretty sure I was going for the world record of how many grapes I could I fit in my mouth. Hi! I'm Marsha. I am a second generation, Chinese-Thai-Texan-American. That Texan part is more important than you’d ever know. I’m a child of immigrants and a wife of a refugee (now a naturalized US citizen). Growing up in a very not-so-diverse suburb of Houston made me acutely aware of the differences between my classmates and myself (from appearances to family dynamics to culture to religion… and definitely what I brought in my lunchbox). However, despite these differences, I am proud of every single part of what makes me who I am today. For me, cooking and eating is the perfect harmony of edible science, art, and love. Watching the Maillard reaction IRL and eating the by-product? Check. 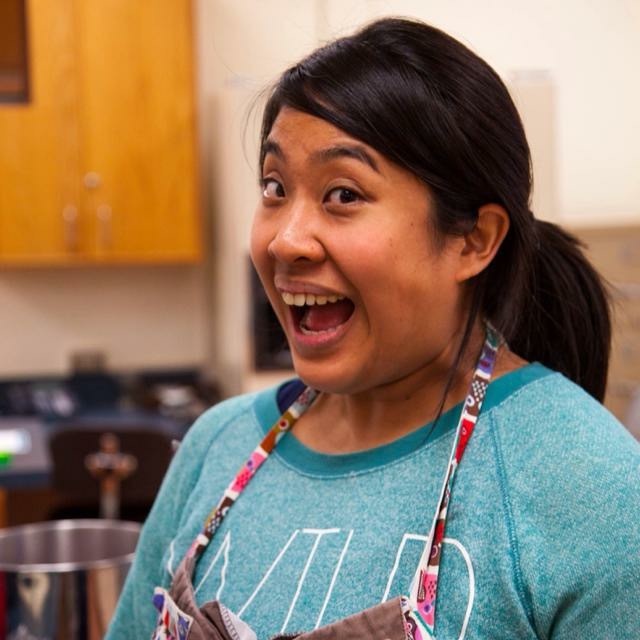 Nerding out over sous vide and molecular gastronomy? Check. Drawing with food (aka plating)? Check. Feeding and nourishing people I love? Check. Sometimes to the chagrin of whoever’s sitting around my dining table. 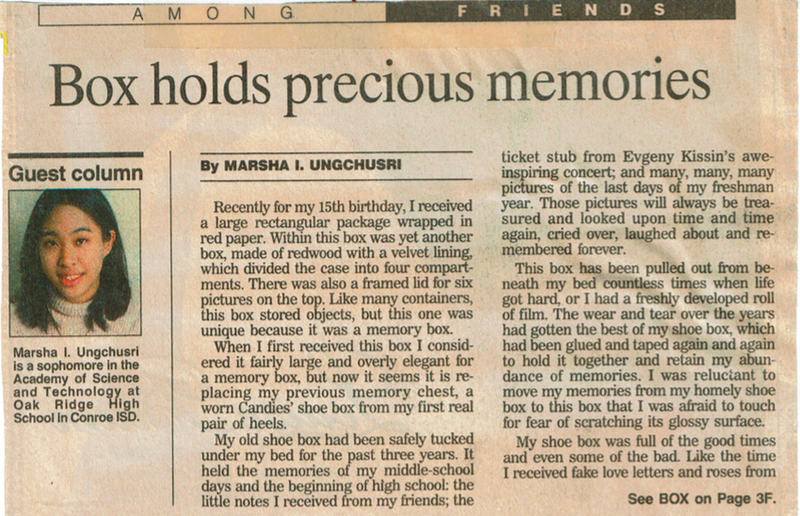 When I was 15-ish, I wrote a piece about memory boxes and friendship for my best friend’s birthday. My English teacher (HI, Mrs. Preble!) helped me polish up my words and submit it to a guest column in the Lifestyles Section of the Houston Chronicle. Y’all. My words got published. On the front page. I got a color photo next to my name! Some lady even looked me up in the phonebook (remember those?) and called me to talk about how my words made her feel all the feels. That’s cool. And then I basically stopped writing after high school. I was afraid to fail. I didn’t think I could top that front-page piece in the city paper. One for one? I’m done. SO, here I am flexing my writing muscles 15 years later to find my writing “voice” again. I love sharing stories, especially about my fam bam and our passion for food. Prepare yourself. We Ungchusris are good eaters. Wait, what just happened? How do you pronounce that? Unguhchooshree? Y’all. It sounds like a sneeze. Uuuuuunngggggg-choooo-see. Or Ung-choosey. If you can say Tchaikovsky, you got this. Pro-tip: the r is silent. Ungchusri means ‘yellow’, so if my dad was Chinese my last name would actually be ‘Wong/Huang’. That would have made handwriting class in kindergarten sooooo much easier. But the way I see it, I got the best of two very delicious food worlds. And now that I’m married to a Vietnamese guy, our future kids are going to eat even better. Future children? Get ready for your palate development. If you’ve made it this far you’re probably thinking, “Girl, you need to get yourself a Xanga!” (remember THAT?). I’m thinking I better stop before I run out of content for the actual blog. Check out my very first post on the actual blog here!